We read the Chronicles of Narnia together. She then read them on her own. There have been other hits since then. She LOVED the book series by Jean Ferris that begins with Once Upon a Marigold, but she sort of began this quiet retreat from reading. She enjoyed me reading to her, but only read independently if I gave her no other alternatives. So, like a totally reasonable parent with a perfectly rational, capable mind, I panicked. What if she grows up to hate reading? What if she never discovers that wonder of losing herself between the pages of a great story? I realized I needed to back off a little bit. I love deep, meaty stories that explore these intense issues with rich narrative. But I started to think maybe that wasn’t what my girl needed at this juncture, when her real life has been full of intense changes. I started paying more attention. Listening to her, learning what she wanted to read. I followed her around a school book fair and promised myself that I’d buy anything (within reason) that she asked to read. She picked a couple of books, one of which was the first in the Ever After High series. We read the series books together. I’m a big fan of Shannon Hale already, so it wasn’t a tough sell. These are different than the other books authored by Hale that I’ve read. Instead of the powerful narrative, the Ever After High books pack a pop-culture punch with a fairytale twist. Characters use their phones to send “hext messages” to one another. They adore music by Taylor Quick and One Reflection. You’ll either find these sorts of references cute or obnoxious, and you’ll have lots of opportunities to feel that way. The premise of the stories is that classic fairytale characters have children after their happily ever afters, and those children must commit to relive the familiar stories, keeping their parents’ legacies alive. One side note: Under this premise, if Cinderella and the handsome prince get married and have a family, then have Cinderella Jr. and Handsome Prince Jr., they would then grow up to live their parents’ story, get married, etc? It seems from the stories like this isn’t at all true, but how it does work exactly isn’t really specified. I think we got past this with four words: willing suspension of disbelief. The trouble begins when Raven Queen (daughter of the Evil Queen from the Snow White story) doesn’t want to be evil. She wants to choose her own destiny and be kind to others. This throws the whole of Ever After High into uproar. If characters start choosing their own destinies, it will mean the princes and princesses are no longer guaranteed a happily ever after. They might have to (queue dramatic music) make one for themselves! The fate vs choice theme runs through all three books, and Hale explores some interesting angles. If Raven rejects her destiny to be the next Evil Queen, does that make her good, or does that make her just like her mother, who in fact rejected her destiny and tried to rule over all fairytale kingdoms? The books are pretty clean. There are mentions of some romance concerning minor characters, but no details. There are some unexplored crushes. It’s very junior high. The books contain no profanity and very little violence. At one point in the first book, Raven (daughter of the evil queen) and Apple (Snow White’s daughter) discover bones in a cave and believe they belong to a former Ever After High student. In the third book, Maddie (Mad Hatter’s daughter) and Lizzie (Red Queen’s daughter) have to fight the fearsome Jabberwocke. There are few battle details and little gore. There is, of course, a lot of reference to magic. Raven Queen has the ability to perform magic, and it misfires whenever she tries to use it for good. She doesn’t give up, though. Birds constantly show up to help Apple White clean a mess. Ashlynn Ella (Cinderella’s daughter) can talk to fairies. Though there are characters who will grow up to be villains in their stories, at Ever After High, everyone is largely at peace with one another, so there’s not a lot of discussion on good vs bad magic. 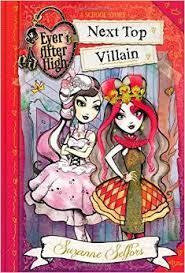 The fourth book in the Ever After High world, Next Top Villain, is written by Suzanne Selfors. My daughter requested it at the most recent school book fair, but we haven’t started reading it yet. Tagged A Wonderlandiful World, Encouraging Kids to Read, Ever After High, Shannon Hale, The Storybook of Legends, The Unfairest of Them All. Bookmark the permalink.